Because of its climate and landscapes, Hainan is often referred to as “China’s Hawaii” or “Hawaii of the Far East.” Resorts are springing up in response to the growing number of visitors from the mainland. The government of China has facilitated this growth by making Hainan into a Special Economic Zone (SEZ), with perks for businesses that invest or develop property on the island. Despite this development, Hainan retains a kind of “island vibe.” People familiar with other parts of China will notice a laid-back, less-frenetic pace to life here. Trees thrive along the boulevards of the capital city of Haikou, and the rural landscapes start right at the city limits, unlike China’s other sprawling population centers. Likewise, the main resort town of Sanya has quiet, natural areas just off of the well-beaten tourist path. What will the rapid pace of developments mean for Hainan’s currently green landscapes, leisurely pace of life and clean air? Time will tell. But for now, the island is one of China’s most accessible and greenest destinations. 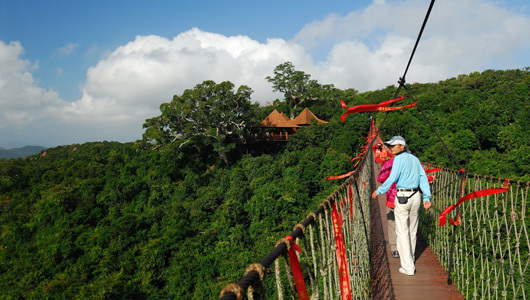 A tourist-centered nature experience can be found in the Yanoda Rainforest Zone, a 17-square-mile tropical garden less than an hour’s drive from Sanya. Large collections of native plants and features like free shuttle bus service from Sanya and the use of electric vehicles inside the park give Yanoda a bit of green credibility. Monkey Island, a tourist attraction and animal sanctuary, is popular because of its namesake primates, though 100 other species of animals and several hundred species of native plants make the island more than just a tourist trap. A less touristy option is the Dongzhai Harbor Mangrove Natural Reserve, just outside the capital city of Haikou. This reserve, which was the first of its kind in China, covers more than 8,000 acres of forest and mangrove wetlands. Dongzhai is a haven for birds, which frequent the wetlands year-round, with most species coming in the wintertime. Marine animals such as shrimp spawn amongst the mangroves during this time of year, providing an unending feast for avian species. Seafood dominates Hainan’s cuisine. However, one of the most popular dishes, Wenchang chicken, is traditionally made with naturally raised chickens. Also, the climate on Hainan means that growing seasons are long and fresh food is available year-round. As with other destinations in East Asia, sticking to a vegetarian diet is not difficult in this part of China. Many sit-down restaurants have non-meat options, and plenty of places specialize in vegetarian dishes. The soy, mushroom and vegetable-based dishes at the Nashan Temple, which is part of the tourist-centered Nashan Cultural Tourism Zone outside of Sanya, are worth a try for vegetarians and non-vegetarians alike. Sanya and Haikou, the two main cities as far as tourists are concerned, are connected by a high-speed train. However, people intent on exploring beyond these two hubs are better off doing so by bus. The roads on Hainan are in good shape and traveling by bus is relatively straightforward. On the other end of the size spectrum is the Bo’ao Inn Bed and Breakfast, an accessible small-scale sleeping spot in the quiet town of Bo’ao. Meanwhile the Haikou Banana Hostel is one of the more overtly environmentally conscious spots on the island. This hostel, which has both private and shared rooms, uses sustainable, local products such as bamboo throughout the property. It even stocks locally brewed liquor from a Wenchang-based distillery. Hill tribes, such as the Li, Miao and Cham, have entered the tourism game, with most offering day-trip experiences. A handful of villages even offer home-stays.